I just want to share some tips on the most frequently cooked snack or even meal whenever we're rushing. We only disregard some warning about this in the past but this one reminder from a close friend opened my eyes to being aware of the common foods that we eat. I've known this for quite some time and have shared this verbally with all of my office friends who are very fond of cooking and eating this whenever they don't have snack or lunch available. Well we can't really avoid instant noodles but we can prevent their harmful effects if we limit our intake and if we cook it the right way. Normally, how we cook the instant noodles is to put the noodles into a pot with water, throw in the powder and let it cook for around 3 minutes and then it's ready to eat. This is the WRONG method of cooking the instant noodles. By doing this, when we actually boil the ingredients in the powder, normally with MSG it will change the molecular structures of the MSG causing it to be toxic. 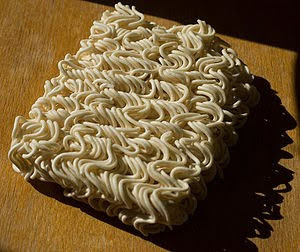 The other thing that you may or may not realize is that, the noodles are coated with wax and it will take around 4 to 5 days for the body to excrete the wax after you have taken the noodles..
A large number of patient with the ages ranging from 18-24 years are ending up with pancreatitis either as a swelling or infection of the pancreas due to regular consumption of instant noodles.... If the frequency is more than 3 times a week, then it is very hazardous.